Nowadays, I’m working on a Chatbot project with Google Dialogflow. In this article, I will present some notions about Dialogflow and Chatbots. Then, I will talk about how to create a simple Chatbot with Dialogflow Platform. 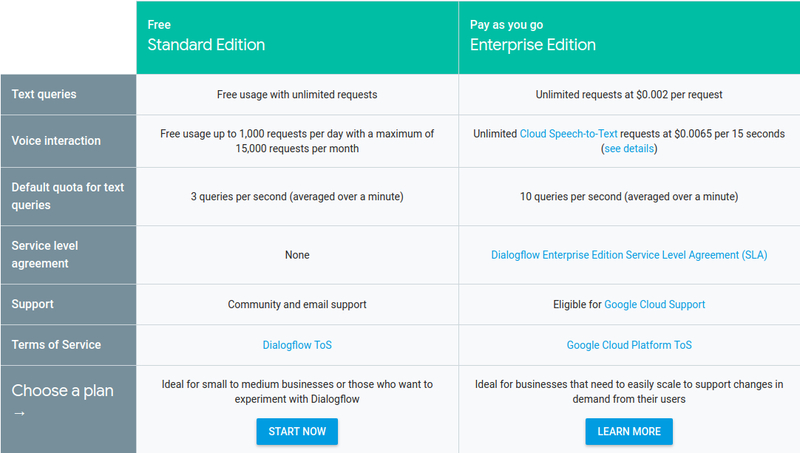 Dialogflow (formerly Api.ai, Speaktoit) is a Google-owned developer of human–computer interaction technologies based on natural language conversations. The company is best known for creating the Assistant (by Speaktoit), a virtual buddy for Android, iOS, and Windows Phone smartphones that performs tasks and answers users’ question in a natural language. 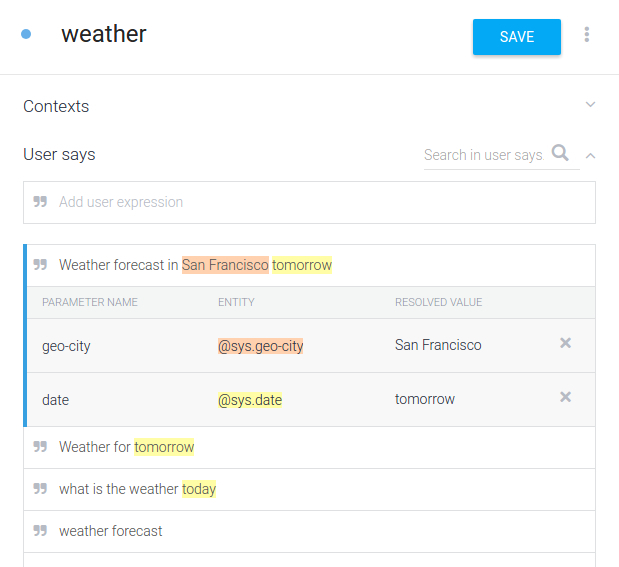 Speaktoit has also created a natural language processing engine that incorporates conversation context like dialogue history, location and user preferences. DialogFlow is quite a good choice to learn how to create Chatbots that you can then integrate them into your own websites or Apps. Dialogflos provides one-click integrations to most popular messaging Apps like Facebook Messenger, Slack, Twitter, Kik, Line, Skype, Telegram, Twilio and Viber. Even to some voice assistants like Google Assistant, Amazon Alexa and Microsoft Cortana. Compared to some platforms which works on predefined questions like Chatfuel, Dialogflow can offer better user experience with NLP. DialogFlow Agents are pretty good at NLP. We define following actions for each intent in the fulfillment (Webhook). When a certain intent is found by Dialogflow, the webhook will use external APIs to find a response in external data bases. The external data bases send back required information to the webhook. Webhook sends formatted response to the intent. Intent generates actionable data acoording to different channels. The actionable data go to output Apps/Devices. The user gets a text/image/voice response. How to build your first chatbot? If you don’t already have a Dialogflow account, sign up. If you have an account, login. Click on Create Agent in the left navigation and fill in the fields. Give a name and set a language to your agent. Then, click the Save button. An intent maps what a user says with what your agent does. 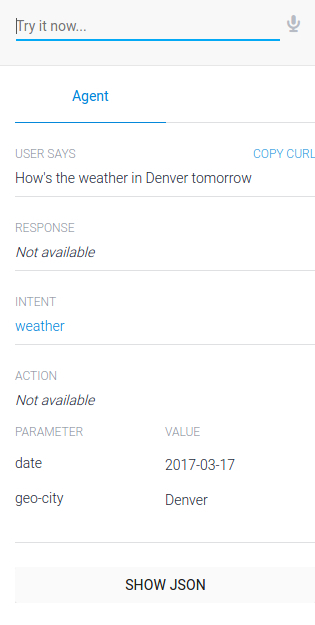 This first intent will cover when the user asks for the weather. Click on the plus icon add next to Intents. You will notice some default intents are already in your agent. Just leave them be for now. Enter a name for your intent. This can be whatever you’d like, but it should be intuitive for what the intent is going to accomplish. In the last three examples you’ll notice the words today and tomorrow are highlighted with one color, and San Francisco is highlighted with another. This means they were annotated as parameters that are assigned to existing date and city system entities. 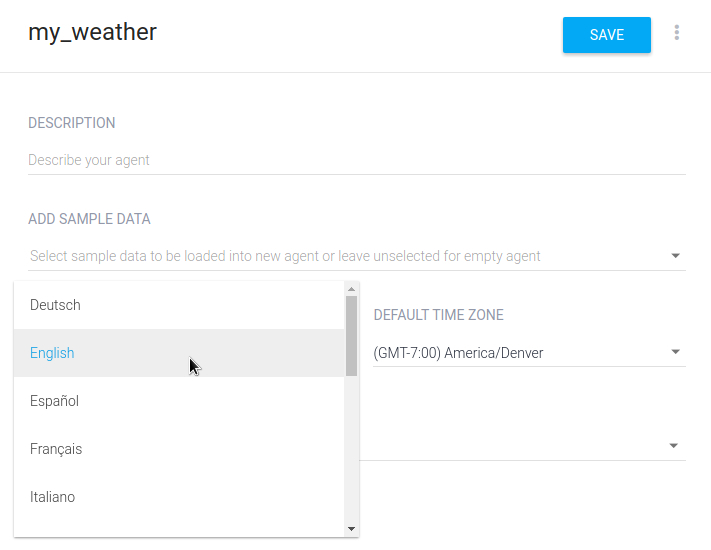 These date and city parameters allow Dialogflow to understand other dates and cities the user may say, and not just “today”, “tomorrow”, and “San Francisco”. Now you’ll add basic responses to the intent so the agent doesn’t just sit there in awkward silence. As mentioned before, responses added to an intent don’t use external information. So this will only address the information the agent gathered from the user’s request. If you’ve navigated away from the “weather” intent, return to it by clicking on Intents and then the “weather” intent. I don’t know the weather for $date in $geo-city but I hope it’s nice! You can see the last two responses reference entities by their value placeholders. 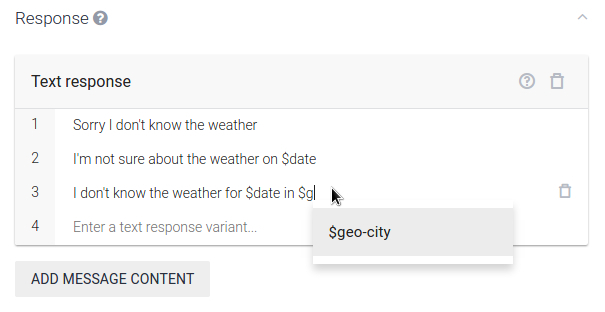 $date will insert the date from the request, and $geo-city will insert the city. When the agent responds, it takes into account the parameter values gathered and will use a reply that includes those values it picked up. For example, if the request only includes a date, the agent will use the second response from the list. In the console on the right, type in a request. The request should be a little different than the examples you provided in the Training Phrases section. This can be something like “How’s the weather in Denver tomorrow”. After you type the request, hit “Enter/Return”. In this article, you have seen what is Dialogflow, some advantages of choosing this platform, how a Chatbot works within Dialogflow and how to create your first Chatbot. Thanks for your reading. Do not hesitate to contact me if there is any problem. Data Science is having an increasing impact on business models in all industries, including retail. According to IBM, 62% of retailers say the use of Big Data techniques gives them a serious competitive advantage. Knowing what your customer wants and when, is today at your fingertips thanks to data science. You just need the right tools and the right processes. We present in this article 10 essential applications of data science in the field of retail. Do you know the Lamport clocks? 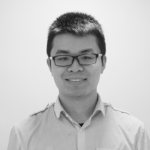 Devoxx France 2018 was the opportunity, during the very interesting talk of DuyHai DOAN , to discover or rediscover this algorithm formalized by Leslie Lamport in 1978, more than ever used today in the field of distributed systems, and which would have inspired the Kafka developers in the implementation of the pattern of Idempotent Producer . The volume of data generated by our systems and applications continues to grow, resulting in the proliferation of data centers and data storage systems. In the face of this data explosion and the investment in skills and resources, decision-makers need sophisticated analysis and sophisticated dashboards to help them manage their systems and customers. Reinforcement learning is considered as the science of decision-making: trying to understand the optimal way to make decisions. Nowadays, it is applied in many different fields and has achieved many distinguished accomplishments.